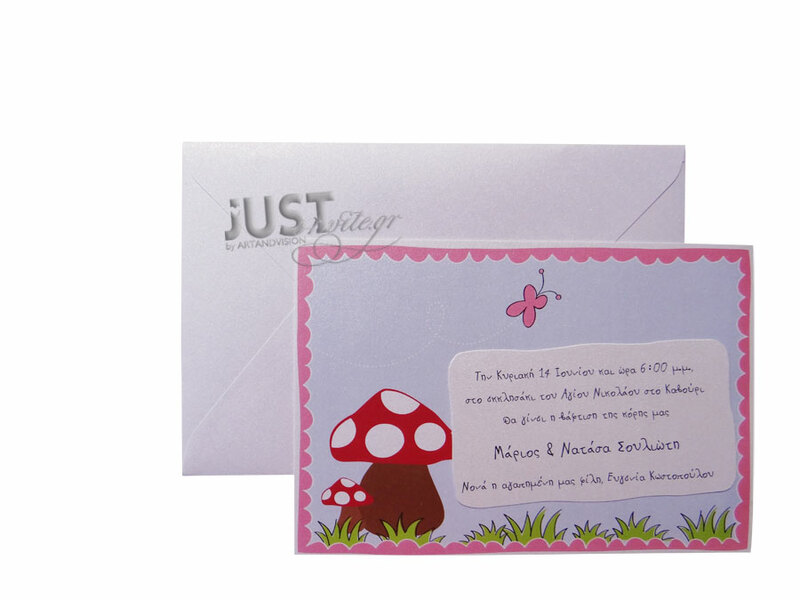 GreekChristening invitations with a mushrooms pattern for your baby girl coming in a board with a mushrooms and a butterfly pattern in cheerful colours. The matching envelopes are long white paper and your personalized wording is printed in plain grey colour. Size: 21 x 14 cm. Choose the wordings of the invitation here. Unit price: 1, 46 euro. Printing Price: 65 euro total (VAT included). Shipping cost not included. https://www.preciousandpretty.com/2017/04/baptism-invitations-with-mushrooms-pattern-for-girl-C1010.html Greek Wedding Favors|Orthodox Crowns|Stefana|Baptism Invitations Baptism invitations with a mushrooms pattern for girl C1010 Greek Baptism invitations with a mushrooms for girl Product #: Greek Wedding Favors|Orthodox Crowns|Stefana|Baptism Invitations_4116536455114899067 5 stars out of 5 reviews.